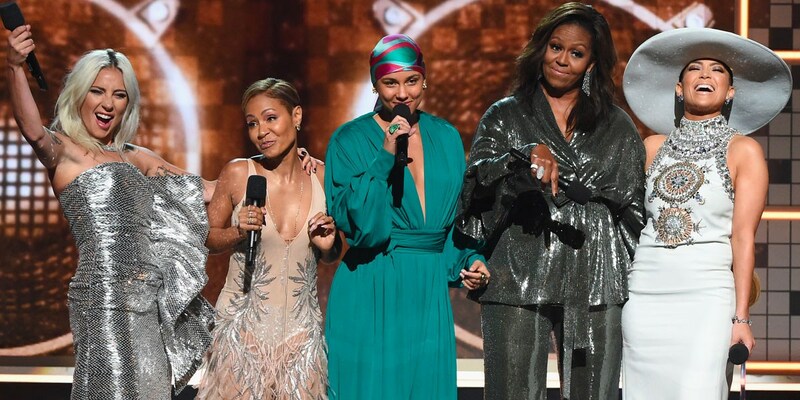 Host Alicia Keys kicked off the 2019 Grammy Awards with the help of special guests Lady Gaga, Jada Pinkett Smith, Alicia Keys, Michelle Obama, and Jennifer Lopez. The ladies appeared on stage to a standing ovation and spoke about the power of music and how it changed their lives. "They said that I'm weird, that my look, my choices, my sound, that I wouldn't work but music told me not to listen to them," Gaga said. "Music took my ears, took my hands, my voice and my soul, and it led me to all of you and my Little Monsters, who I love so much." Watch below and click here to watch Gaga's performance of "Shallow."